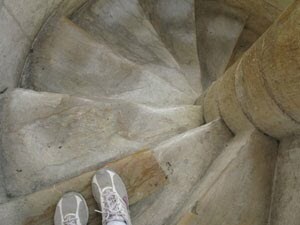 I’ve walked up and down 294 uneven stone steps of the narrow circular stairway inside the Leaning Tower of Pisa. Knowing that the tower is inclined 14 feet to one side, I’m amazed that the structure can withstand visitors tromping up its innards and roaming around the belfry. Even at the top—183 feet from ground level on the lower south side and 186 feet on the north side--I don’t notice a tilt. The fact that it feels erect from the inside makes the view from the bottom, outside, more awe inspiring. 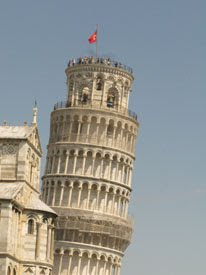 The Tower, after all, is a monumental failure of architecture; it not only leans but actually curves. Ironically, the soft, unstable soil that began to sink early in construction turned out to be a solid foundation for future tourism. The rather ordinary town of Pisa, Italy, became famous because of a construction blunder--the architect didn’t know the land was once part of a river delta, making it unsuitable for large, heavy buildings. Architects determined early on that the slippery stones I’ve stepped on were a factor in the Tower’s tilt, which became evident shortly after construction began in 1173. Work on the Tower stopped, and it was left unfinished for a century. When building continued in 1272, heavy counter weights were added to the north side, which caused the Tower to lean in the other direction—and contributed to its curved shape. When construction resumed in 1360, six steps were added to the south side and only four to the north side to accommodate the tilt. After massive engineering feats in the late 1990s, the tilt has been reduced to four degrees from vertical and the Tower stabilized, allowing tourists the opportunity to feel immersed in the history represented by this monument.